Last week, Hugo Chavez equated Israel’s aerial bombardment of Lebanon with Nazi war crimes and recalled his ambassador from Tel Aviv. The next day, Israel’s Foreign Ministry responded by calling home its envoy in Caracas, Shlomo Cohen. On Wednesday, Chavez announced that he was about to break diplomatic relations with Israel altogether. The escalating war of words between Israel and Venezuela — longtime trade partners — is causing concern among Venezuela’s dwindling Jewish community and in Washington, where U.S. officials view Chavez as Latin America’s greatest threat to democracy. But Bernardo Alvarez, Venezuela’s ambassador to the United States, defends his president’s actions. “We don’t have any problems with Jews,” Alvarez told JTA in an interview Tuesday at the Venezuelan Embassy in Washington. “We have a large Jewish community, and we have had relations with the State of Israel for a long time. With an estimated 15,000 Jews, Venezuela is home to one of the largest Jewish communities in Latin America, yet it’s the only country to recall its ambassador to Israel in order to protest the current fighting. “We thought we should tell the Israeli government that this is not the way to do things — no matter what happened — and that you cannot resort to such violence,” said Alvarez, who never during the interview criticized Hezbollah’s continuing rocket and missile attacks on Israeli civilians or its kidnapping and killing of Israeli soldiers. Hezbollah is supplied and financed by Iran, though Alvarez claims Venezuela’s anti-Israel position “doesn’t have anything to do” with Chavez’s trip to Tehran. “We have a long relationship with Iran that goes back many years, and is based on many common interests, starting with oil,” he said. Alvarez tried to distance Chavez from some of Ahmadinejad’s more inflammatory statements, explaining that “we have relationships with many countries around the world, and it doesn’t mean we support all of them. Venezuela’s position is very clear: we don’t agree with that statement made by the president of Iran” calling for Israel’s destruction. He added that Venezuela has good relations with Libya, and now has observer status at the Arab League. “This is part of our strategy of reaching out to the world,” he said. The strategy has infuriated the Bush administration, which has watched as Chavez travels the globe, embracing not only Ahmadinejad and Libya’s Moammar Ghadafi, but also other dictators such as Cuba’s Fidel Castro and Alexander Lukashenko of Belarus. Earlier this year, Chavez was accused of fanning the flames of anti-Semitism after a Christmas eve speech in which he referred to “minorities, descendants of those who crucified Christ” who today control the world’s economy. The government later claimed Chavez wasn’t referring to Jews. But the incident heightened concerns about Chavez dating back to a police raid on a Jewish school in Caracas in November 2004. Two high-ranking officials from the World Jewish Congress met with Chavez in late July at the residence of Argentina’s president, Nestor Kirchner, to discuss his government’s attitude toward Venezuela’s Jewish community. The congress would not give details of the meeting. The United States remains Venezuela’s biggest customer, buying 60 percent of the country’s total exports. The biggest component of the trade is oil; Venezuela’s state-owned PDVSA oil monopoly ships 1.2 million barrels of crude a day to U.S. markets and also owns refineries in Louisiana, Texas and the U.S. Virgin Islands. In addition, it has 100 percent ownership of the Citgo gas-station chain. 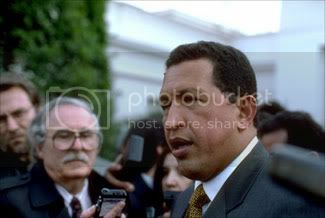 Bilateral relations took a turn for the worse after Chavez — who had led failed coup attempts against the Venezuelan government in the early 1990s— was elected president in 1998. Washington prevented Israel from selling Venezuela spare parts for its aging F-15 fighter jets. Thanks partially to record-high oil prices that allow his government to spend lavishly on social programs, Chavez remains wildly popular. Presidential elections are scheduled for Dec. 3, though if the election were held today, pollsters say, Chavez would win 55 percent to 60 percent of the vote, thanks to his years of pumping oil revenues into new housing projects, community clinics and road construction. Meanwhile, Venezuela’s political opposition is fractured, with one presidential candidate — prominent Jewish economist Teodoro Petkoff — withdrawing his candidacy only a few days ago. At least one Latin American expert cautions against overreacting to Chavez’s incendiary comments. Birns said he doubts Chavez will follow through on his threat to break diplomatic ties with Israel.